DRAG – Sticking brakes, hot wheels or engine which seems to have lost power. Auto brakes may be failing to release; the condition can reverse itself, leaving you with no brakes at all. This would indicate brakes service is needed. PULL – Vehicle pulls to one side when brakes are applied. 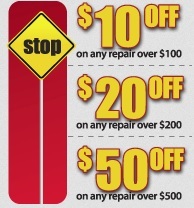 May be underinflated tire, misadjusted brakes or brakes are in need of car brakes repair. BRAKE LIGHTS- Red indicates a problem as simple as the parking brake on, or low fluid, to something as serious as a hydraulic system failure. Yellow indicates deactivation of your ABS system. 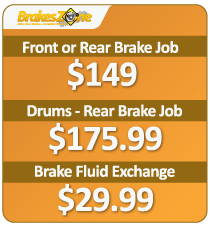 While your brakes should work, it does require inspection at the first opportunity. VIBRATION – Brake pedal, steering wheel or entire vehicle shakes, vibrates or pulsates when brake is applied. May indicate need to resurface disc brake rotors – or signal a serious problem of a loose component or faulty steering mechanism. SQUEAL – Brakes should operate with a minimal amount of noise. Some noise is normal but excessive squeal, screech, grinding, groaning, chatter, clatter or bang means your brakes need of car brakes repair. LOW PEDAL – Pedal nearly touches floorboard before brakes function. May activate your brake warning light. Problem may require a simple adjustment – or indicate something much more serious. GRAB – “Touchy” brakes that grab with the least pressure. May indicate a problem as simple as grease or oil contaminated linings – or as serious as loose or broken component ready to fail in an emergency.